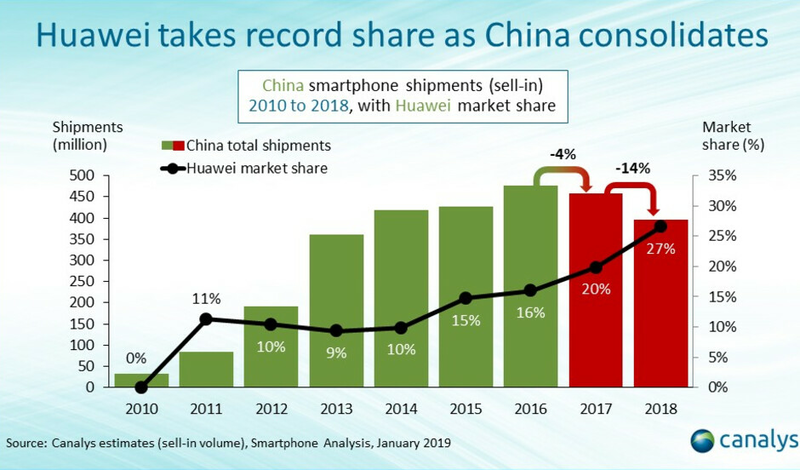 The Chinese smartphone market was held hostage last year to a weak economy in the country, partially related to the ongoing U.S.-China trade war. Thanks to research firm Canalys, we can quantify the damage in numbers. Last year, Chinese smartphone shipments amounted to 396 million units, a decline of 14% from 2017, and the lowest total since 2013. The year was topped off with a 15% year-over-year decline in shipments for the fourth quarter. That makes it seven consecutive quarters with lower shipments. However, the top five Chinese companies were able to increase their hold on the market. Those firms accounted for 88% of Chinese smartphone shipments in 2018, up from 73% in 2017. To see how bad things were in the Chinese smartphone market last year, consider that the fifth largest handset company in China was Apple. Even though its 9% market share last year equaled its performance in 2017, the company shipped 13% fewer units in the country in 2018 compared to the previous year. 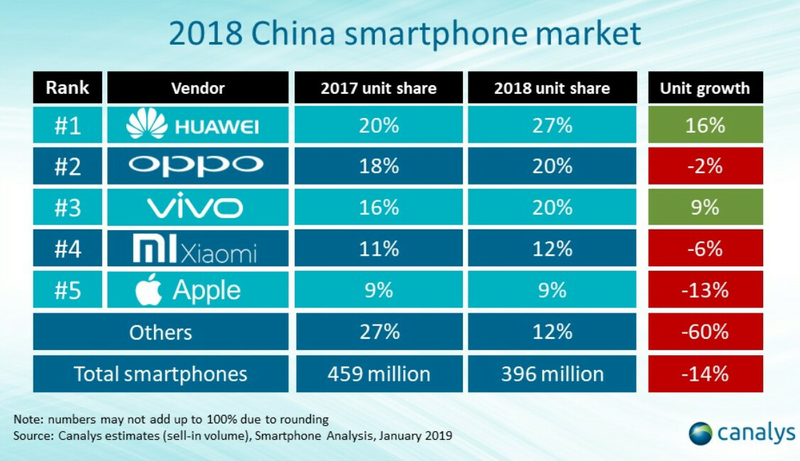 The top smartphone manufacturer in China last year was (no surprise) Huawei, which shipped 16% more units than it did in 2017 as it delivered 105 million handsets in the country. As a result, its market share rose to a record 27% from 20%. Despite a 2% decline in shipments, Oppo took the second spot with a 20% share of the Chinese smartphone market last year. That was up from 2017's 18%. Vivo was third after growing its shipments by 9% in a weak market. The company now owns a 20% share in China. Next was Xiaomi, with a 12% slice of the pie. It's shipments declined 6% in 2018. The others category was a disaster, with those companies' market share declining to 12% from 27% during the previous year. Shipments by these firms declined a whopping 60%. And things could get worse this year, with Canalys calling for a 3% decline in total shipments to 385 million. If Apple wants to pick up ground in China, it will have to take a look at its pricing strategy and trends in the foreign exchange market. 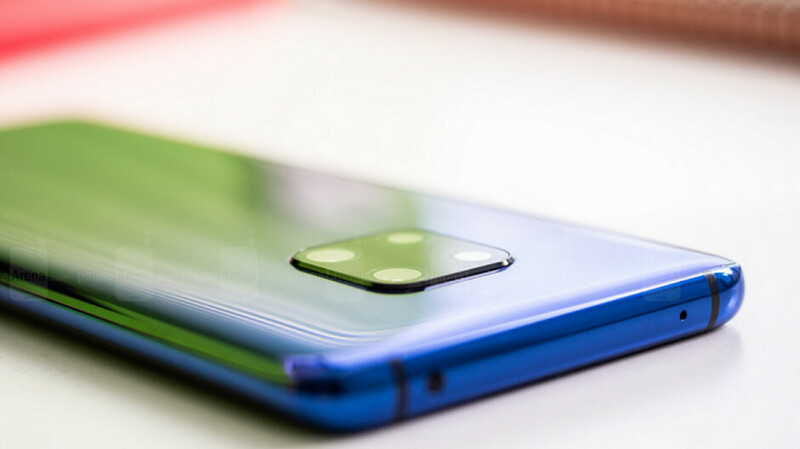 Due to the dollar's strength against the yuan, the "more affordable" iPhone XR was priced above the premium Huawei Mate 20 Pro in the country, which forced Apple to slash wholesale prices of its 2018 models in China. Huawei has designs on becoming the top smartphone manufacturer in the world as early as this year, despite the lack of a partnership with any U.S. carrier. Currently trailing Samsung, Huawei might be able to take the top spot by continuing its domestic growth. "If Apple wants to pick up ground in China, it will have to take a look at its pricing strategy and trends in the foreign exchange market. Due to the dollar's strength against the yuan, the "more affordable" iPhone XR was priced above the premium Huawei Mate 20 Pro in the country, which forced Apple to slash wholesale prices of its 2018 models in China." Very true, I find it amazing that so many iPhone fans are adamant that price has nothing to do with the fall in iPhone popularity in China and elsewhere. If the iPhone XR is made in China why is the exchange rate a factor for the Chinese market? It's not like they're shipping it to Cupertino and back to China again. Sounds like greed to me. Meanwhile Huawei isn't dominating jack$hit in China. BBK via Oppo and Vivo are crushing everyone with 40% market share. Way ahead of Huawei. They should be given credit for that. Vivo and oppo are part of same parent company but both are not consider same becouse they don't share technologies in a same manner as a same company should do (like oppo and realme, huawei and honor, ZTE and nubia, Xiaomi and Redmi,). They are more like a competitor to each other. Consider it anyway you like but the clear winner is BBK. I can assure you that when they're buying their bulk components from Qualcomm etc they're buying as a group and not as individual companies. So however it looks from the outside, it's one company running the show. The way it works is that iPhones are manufactured in a special customs area, they have their own customs officers and a border., it's all done for tax reasons. This means iPhones have to be actually imported into China even though they are made in China, these imports are all done in dollars and not the yuan. In a market that dropped 15% Apple has managed to keep its decline under that value, which means fewer customers than the average decided not to buy their products. That and the fact that over 90% of the users are not switching platforms are clear signals that the price has little to do with apple’s performances in China. Apple dropped by 13% (14% for the overall market) whilst the next highest drop in the top 5 was Xiaomi's 6%. Less than half of Apple's decline. Wtf are you reading? When your market share drops 13% in a market that dropped 14%, it means you outperformed the market - you dropped less than the average. Where the average company managed to keep 86 clients out of 100, Apple managed to keep 87 (one more) out of 100. Ok. I guess that's one way to polish a turd. The worst performing of the top five but it's still a win in Apple fantasy land. That 14% drop is reflective of the huge drop in the "other" category. Apple matched that poor performance btw. Just saying. That's what I've been saying: Apple outperformed the Chinese MARKET, I never said it outperformed every individual company in that market. Leo please tell me you're not doing this deliberately to get a response. That's like saying cow turds are better than horse manure. They're both $hit. A 1% difference is meaningless. Apple performed the worst of the major players (top five). Accept it ffs. Nobody is denying that there are a lot of other companies that outperformed Apple in China (they did worse in other markets, but that's another topic), yet despite that drop in units, Apple managed to keep its market share. Other reports go as much as 20% drop in unit sales, others are saying that Apple passed Xiaomi to regain the 4th place and other sing the bankruptcy of Apple. I'm just saying that Apple is back in 2016 and is going to bounce back soon. At least you admit "Apple is back in 2016"! Lol Bouncing back is another story entirely. I don't see them returning to their glory days until they stop being so complacent on both the hardware and software fronts. 2016 was a good year that paved the way for the best year in the history. Apple hasn't lost market share, which means everything is (still) ok.
Hauweis sales in China will be further fueled by today's charges in the US. Nationalism is growing there. It's no wonder Oppo, Vivo and xiaomi have not tired to push into the USA. The population and market in China is huge, goodness. Can you imagine the worldwide sales. Apple needs a Sub brand to manage the money makers aka mid range phones, I believe that where the real money is/will be. Most of Apple's IP is their software and SoC design, which is still preserved. Regarding components, Apple never made them themselves, but bought them from suppliers like Qualcomm (modem), Samsung (RAM, NAND, display etc), TSMC (fabrication), FOXCONN(assembly), Sony(sensors) etc. Apple never owned these IPs and Chinese companies have started buying this tech as well. It's simple and fair competition. Stealing of IP has nothing to do this with it. Competition from China was coming, and there's nothing you can do about it. No other country can make semiconductors at a scale like China, so it's not like it could have gone any other way in an alternate reality.